Home » News » Robert Dahl, Sterling Professor Emeritus in Political Science, passes away. Robert Dahl, Sterling Professor Emeritus in Political Science, passes away. Robert Dahl, Sterling Professor Emeritus of Political Science and Senior Research Scientist in Sociology, passed away yesterday at the age of 98. He died peacefully, surrounded by his family. 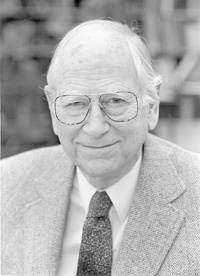 Professor Dahl was a member of the National Academy of Sciences, the American Philosophical Society and the American Academy of Arts and Sciences, a corresponding member of the British Academy, an honorary member of the Manuscripts Society and a past President of the American Political Science Association. He received an honorary Doctor of Laws (LL.D) degree from Harvard University. He was a Guggenheim fellow in 1950 and 1978 and a fellow of the Center for Advanced Study in Behavioral Sciences in 1955–1956 and 1967. He was the 1995 recipient of the Johan Skytte Prize in Political Science. He holds numerous honorary doctorates in addition to other major awards in recognition of his remarkable standing in the profession. Professor Dahl was born in Inwood, Iowa in 1915 and in 1926 moved with his family to Skagway, Alaska. His book, After the Goldrush: Growing up in Skagway, described his life and adventures growing up in the mountains and hills of Alaska. He has written extensively and his publications include Congress and Foreign Policy; Politics, Economics and Welfare (with C. E. Lindblom); A Preface to Democratic Theory; Who Governs? Democracy and Power in an American City; After the Revolution? ; Polyarchy; Size and Democracy (with E. R. Tufte); Dilemmas of Pluralist Democracy; A Preface to Economic Democracy; Controlling Nuclear Weapons: Democracy Versus Guardianship; Democracy and Its Critics; Toward Democracy: A Journey; On Democracy; How Democratic is the American Constitution?, Politica e virtu’ , La teoria democratica de nuovo secolo, and On Political Equality. His books have been published in multiple languages. See him in an interview with Margaret Levi, editor of the Annual Review of Political and professor of Political Science at University of Washington here. You can view his Department of Political Science at Yale University bio here. Professor Dahl was a great teacher, mentor and friend. He will be missed.